Με δυνατότητα παραγγελίας όλων των συνδυασμών τεχνικών χαρακτηριστικών (βλέπε CTO). Pros love iMac. So when they asked us to build them a killer iMac, we went all in. And then we went way, way beyond, creating an iMac packed with the most staggeringly powerful collection of workstation-class graphics, processors, storage, memory, and I/O of any Mac ever. And we did it without adding a millimeter to its iconic all-in-one design. So everyone from video editors to 3D animators to musicians to software developers to scientists can do what they do like they’ve never done before. 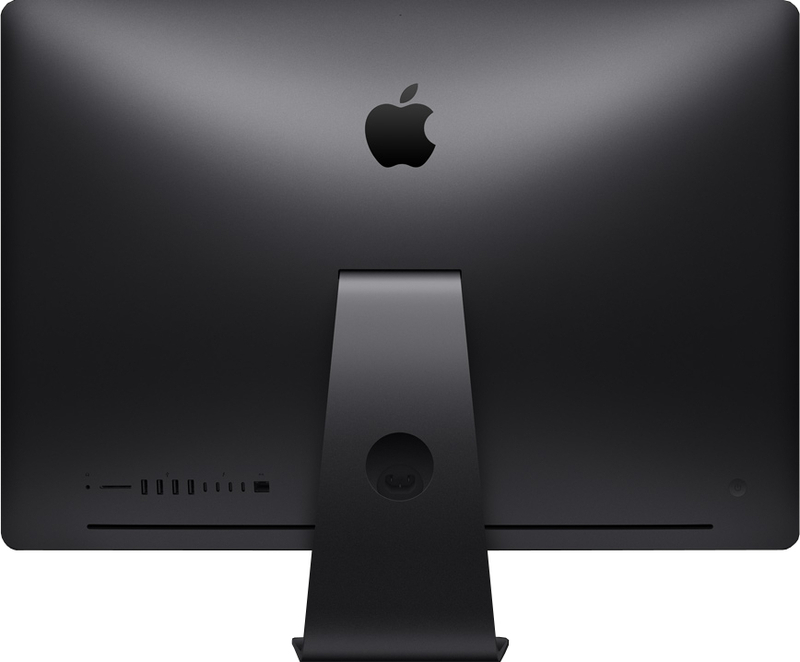 Introducing iMac Pro. A lean, mean dream machine. 18 cores in an iMac. No, that’s not a typo. An iMac with 8 cores is remarkable enough. But an iMac with up to 18 cores is an entirely different creature. Add Turbo Boost speeds up to 4.5GHz, and iMac Pro has the power and flexibility to balance superb multicore processing with great single-thread performance. So whether you’re rendering files, editing 4K video, creating real-time audio effects, or compiling your next five-star app, it all gets done at lightning speed. Proof, once again, that there’s strength in numbers. 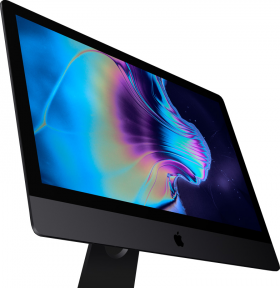 When we considered how much we wanted this iMac to be capable of, it was clear that only one graphics chip would do — but that chip didn’t exist yet. So iMac Pro is debuting a new one. The Radeon Pro Vega is over three times faster than any previous iMac GPU, packing the power of a double-wide graphics card into a single chip. All of which translates to higher frame rates for VR, real-time 3D rendering, more lifelike special effects, and gameplay at max settings. 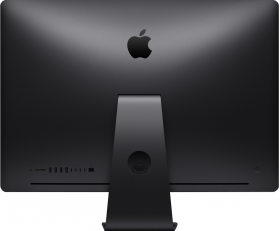 It’s one huge reason iMac Pro is power incarnate. 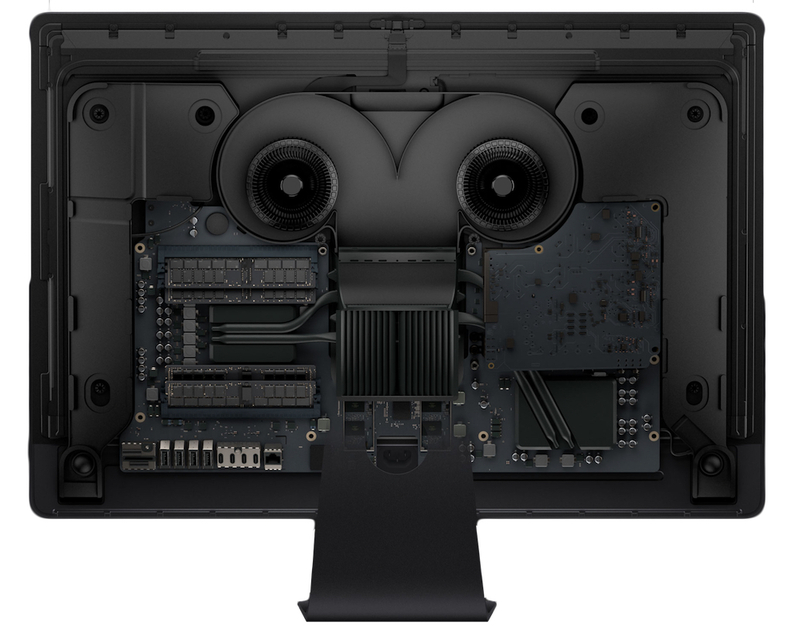 iMac Pro can accommodate an impressive amount of memory — up to 128GB. So you can visualize, simulate, and render huge 3D models. Create multiple test environments for cross-platform development. Keep numerous apps open at the same time. And slice through data-intensive tasks like a hot knife through butter. Up to 4TB of all-flash storage lets you work on large 4K and HD projects regardless of codec. And with up to 3GB/s throughput, loading huge files and launching apps is faster than ever. Want to see how fast? Want to see it again? As you’d expect from a pro machine, there are plenty of high-speed ports to create a high-performance workstation. For starters, you’ve got four Thunderbolt 3 ports, so you can connect two 5K monitors — for a whopping 44 million pixels total — and transfer data at a blazing 40Gb/s. And there’s something you probably didn’t expect in an iMac: 10Gb Ethernet. So sharing files between desktops, or working with high-performance network storage, is up to 10 times faster. Create a powerful workstation by connecting two RAID systems and two 5K displays to the four Thunderbolt 3 ports. Then see your work on a 44‑million‑pixel canvas. 10Gb EthernetAlso supports Nbase-T industry-standard 1Gb, 2.5Gb, and 5Gb link speeds. Retina 5K display. Hold on to your pixels. 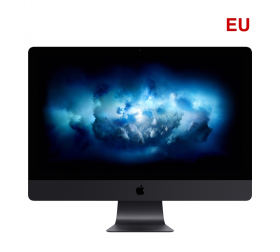 It almost goes without saying: If it’s an iMac, it will have a gorgeous display. And iMac Pro doesn’t disappoint. In fact, its 27-inch screen is our best ever, with a dazzling 500 nits of brightness across its 14.7 million pixels. Along with P3 color and support for over a billion colors, iMac Pro delivers spectacular true-to-life images. One billion colorsSupport for 10-bit spatial and temporal dithering. Performance takes power, and power makes heat. To deal with it, we completely redesigned the thermal architecture of iMac Pro with innovative dual blowers, a massive heatsink, and extra venting. The result? Almost 75 percent more airflow and an 80 percent increase in system thermal capacity. Which lets iMac Pro handle 500 watts — 67 percent more power than the previous iMac — and stay chill. iMac Pro is as epic to your ears as it is to your eyes. Its enhanced stereo speakers deliver broad frequency response, rich bass, and more volume. So you’ll be able to hear that crashing cymbal, multilayered effect, or sample-based sound, all with remarkable fidelity. The perfect match for iMac Pro, these new space gray accessories are wireless, rechargeable, and beautiful to behold. The new Magic Keyboard includes a numeric keypad, and to go with it you can choose either the Magic Mouse 2 or Magic Trackpad 2.